The EMC is currently hard at work developing the EMC KS3 Curriculum Package. Drawing on existing resources and others that are in development, this package is in line with recent noises being made by Ofsted about providing a content-rich curriculum for 11-14 year olds. But we think it goes even further than what Ofsted is calling for, prioritising, alongside superb content, pedagogical approaches that lie at the heart of English: creativity, discussion, personal response, exploratory work, and so much more. At the English and Media Centre we have always placed the curriculum at the heart of what we do. 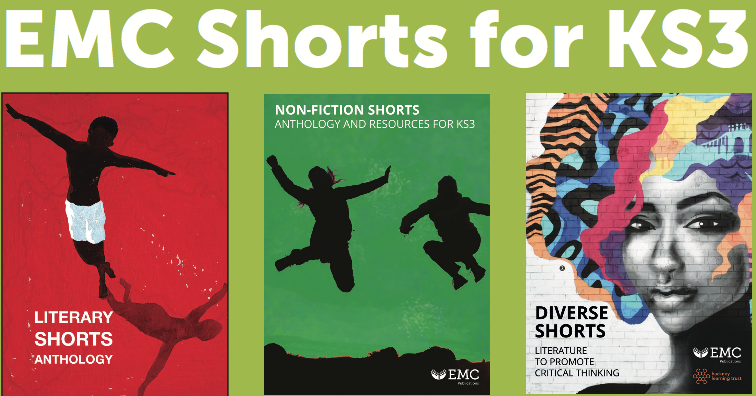 Be it an introduction to short stories in Year 7, or high-level textual analysis at A Level, our resources focus relentlessly on working with the nitty-gritty of the subject – stimulating literary texts and rich language resources. The GCSE tests are designed to cover 2 years’ worth of content. It is hard to see how taking longer than 2 years could expose pupils to more knowledge and not more test preparation. This situation has made us think at EMC about what we can do to help. It occurs to us that the resources we have developed for KS3 in recent years (and continue to develop) are now substantial enough to cover a large part of an entire 11-14 curriculum. Consequently we are combining some of our existing publications with material due out this summer to create an EMC KS3 Curriculum Package. It doesn’t contain everything required for teaching at KS3 because we’d always want schools to include material they have developed themselves in a curriculum, based on their own interests and their students’ needs. But if you are looking for a brilliant way to reinvigorate or develop further a rich, content-driven curriculum of real substance then we think that we have a fantastic package. A draft preview of the EMC KS3 Curriculum Package's content is available here. Imagine my disquiet when I discovered the current situation at KS3 in English. My impression after spending 6 months teaching (I am on my second placement now) is that there is far too much emphasis on GCSE to the detriment of KS3 pupils who are at risk of being switched off by overzealous teachers intent on preparing them for exams. There is obviously excellent work going on in primary schools and as teachers we need to really inspire our students with a rich grounding tp prepare them for the challenges they will meet at KS4. This is such an important task!